Continuing the LEGO® winter series, build the Winter Village Cottage for a perfect holiday home. Seat Grandpa snugly by the fireplace with his newspaper as you help Dad to put up the tree, then bake a feast in the kitchen with Mom! When it's time to stock up the storage shed with firewood, bring the kids for a ride with Dad on the sled to watch him cut the wood with his chainsaw deep in the forest. When the snow gets really deep, clear the road with the snowplow, take all of the kids skiing or build an igloo to play in. There's no cozier place to spend long, frosty nights! 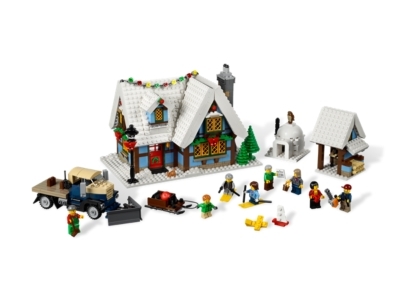 The Winter Village Cottage (10229) Lego set is no longer directly available from the sites below. However, 3rd party partners of these sites might still have the set available. Alternate description Get cosy in the Winter Village Cottage! Build a holiday home with the Winter Village Cottage, includes Christmas tree, fireplace with light brick, igloo, sled and snowplow! Hele mooi gezellige set voor bij het winterport. Mooie kleuren combinaties in de set. Enige min puntje, de bovenverdieping is niet bereikbaar via een trap en je dakraam is een blind raam.